A recent fact-finding visit by a Left-wing delegation to the worst Naxalite-infected areas of Bastar division in Chhattisgarh has found that there has been large-scale arrest of villagers, with the law being allegedly used by the cops “as an instrument of torture rather than of justice or peace-keeping”. Seeking a “high level judicial enquiry on all the encounters, arrests, surrenders, rapes and other atrocities by state-sponsored vigilantes, police, security forces and Naxalites since 2005”, the delegation has taken strong exception to a new form of the armed anti-Maoist organization Salwa Judum, banned by the Supreme Court, cropping up in the region. The delegation comprised of Sanjay Parate, Chhattisgarh state secretary CPI-M; Vineet Tiwari, Joshi-Adhikari Institute, CPI, New Delhi; Prof Archana Prasad, Jawaharlal Nehru University, associated with the All-India Democratic Women's Association, and Prof Nandini Sundar, Delhi University, visited Bastar Division from May 12 to 16, 2016. Pointing towards how people are caught between atrocities of the police and the Maoists, the report said, “On April 15, the police/CRPF held a Jan Jagran Abhiyan in Kumakoleng. 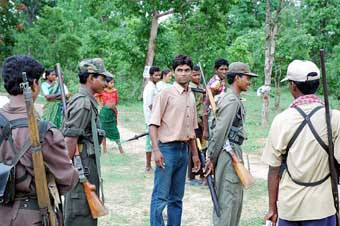 On April 17, the Maoists beat up villagers, including women, for asking for a CRPF camp to come up near their village. Two-thirds of the entire village of Kumakoleng has now fled and is living outside the village for fear of Maoists”. Claiming that the police “is not interested in any peaceful and honest approach to the problem” the report pointed towards a fake encounter, which took place at Marjum village, in which two innocent youth, Markam Manglu and Podiyam Vijja, were killed, but they were passed off as Maoists by the police. The CPI held a demonstration on May 19 in Dantewada to press for a fair enquiry into the incident and registration of an FIR.